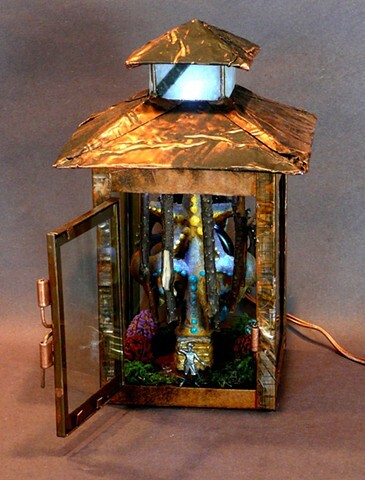 Copper sheeting covers the roof of a thrift store lantern while inside a shrine made of an iron finial from a collectibles store on Ruby Street and some dark little twigs is lit by white LED lamps. This is one of my 3D pieces that really has to be seen in person to take it all in. Unfortunately, you can't unless Al will let you take a peek at it.